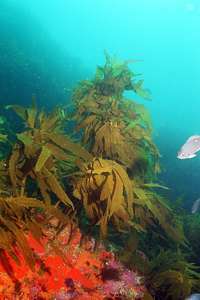 For as yet unknown reasons, large kelps dominate in temperate and subantarctic seas. 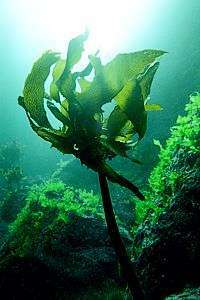 The dominant kelp of New Zealand's rocky shore is the stalked kelp Ecklonia radiata. It usually grows in dense thickets, which makes artistic photography difficult.But here is what it looks like. 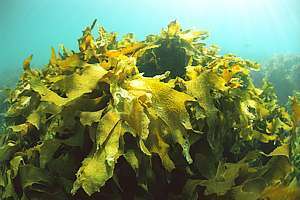 New Zealand has other large brown seaweeds, not shown here. 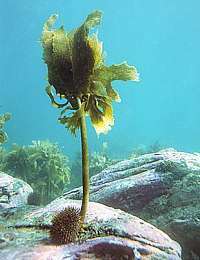 f019729: a lonely kelp plant has survived inside the urchin-grazed zone, now colonised by sea lettuce. f020103: a tranquil moment under water. 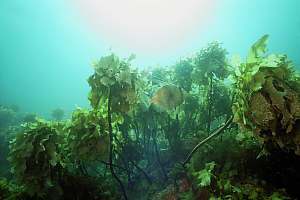 Ecklonia radiata f012025: this row of stalked kelp plant shows their individual forms clearly: a proud canopy supported by a long stipe. f022030: A natural kelp forest in a healty environment is subject to continual and gradual rejuvenation. 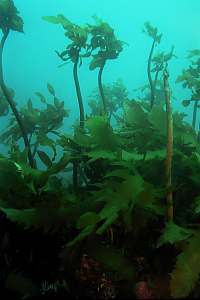 This picture shows old, tall, well-grazed kelp being replaced by young ones. 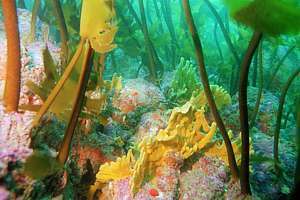 f007303:The deep kelp forest is a major feature of the seascape in northern New Zealand. 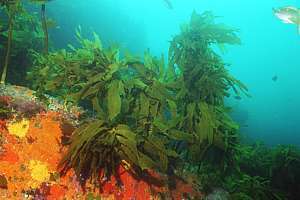 Further south, other seaweeds gradually take over. 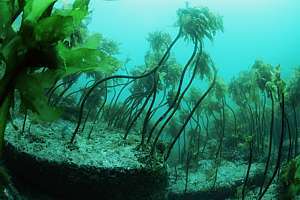 The kelp forest shown here has, after six years, only just recovered from a major kill. 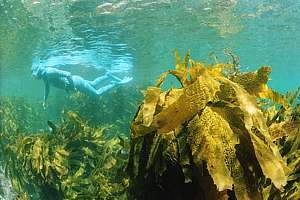 f022836: in healthy kelp forests, the canopy is tightly closed. Because the fronds move incessantly, even those a bit lower down, receive enough sunlight to survive. 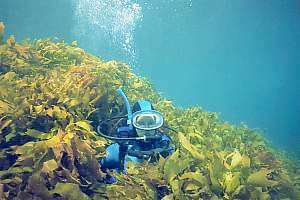 f022837: By standing upright between the plants, a diver shows how tall the kelp plants can become. f041536: In very sheltered waters, the kelp forest can reach the surface where its golden fronds create a sense of paradise. 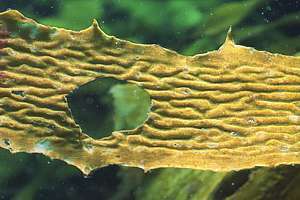 Notice the ribbed corrugations in mature leaves. 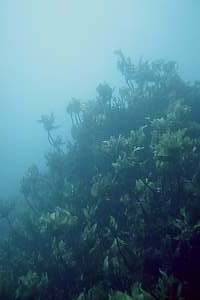 (Poor Knights Islands). Successive low tides limit them growing further. 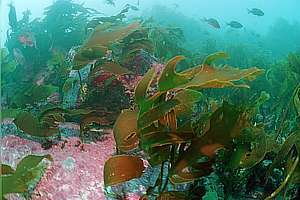 f006837: A healthy kelp forest on a boulder-strewn coast, with young plants emerging on light patches. A small light-shy red rocklobster (Jasus edwardsii) benefits from the shade, as do various colourful carpet sponges. 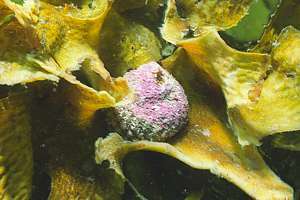 f042112: Young kelp begins as a small leaf on a tiny stalk, attached to the pink paint. As the leaf extends, it sprouts side leafs. Notice the gold margin of these healthy plants. f042620: But in warmer waters( North Island, NZ), the canopy becomes quite messy. Notice how the gold margin has disappeared. 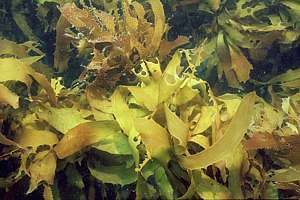 f048834: Usually a light colour indicates new growth and good health, but this photo shows pathological jaundicing (yellowing), a kelp disease. 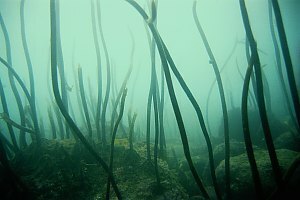 f033816: Ironically, at the kelp forest's lower boundary (from lack of light), the plants grow tall but spindly. Apparently they are grazed less than their faster growing cousins. 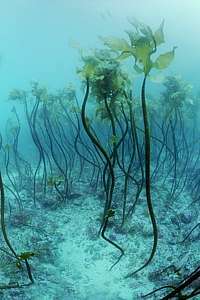 f036733: Where a bright sandy bottom borders the kelp forest's lower boundary, individual plants can grow deeper still, due to the reflected light from the white sandy bottom. 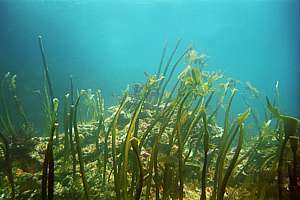 f019736: in order to survive in shallow, wave-washed water, shallow kelp plants must be firmly anchored, have thick stipes, and they cannot afford to grow tall. 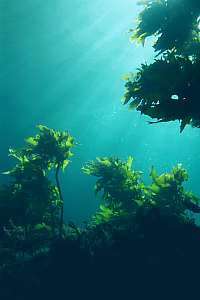 Their canopies are also constantly trimmed by the waves. 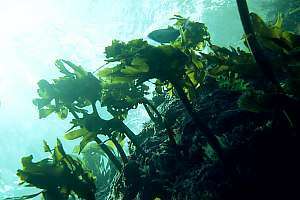 f022812: In sheltered waters, the kelp plants are allowed to grow excessively tall, with massive crowns. 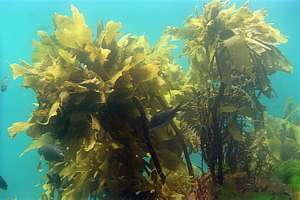 Here the old kelp is falling over, opening the forest canopy for young plants to take over. 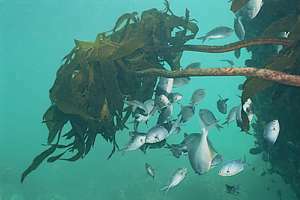 A John Dory in the centre. f035711: bite hole of the butterfish Odax pullus f035712: top shells like this Cook's turban snail (Cookia sulcata) graze the slime-covered fronds. More common is the smaller green topshell Trochus viridis. 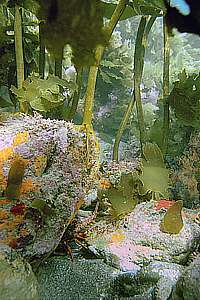 f006828: a common green urchin considers clear-felling a lonely stalked kelp plant. 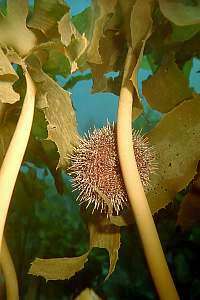 f019724t: A sea urchin has clambered all the way up a kelp stalk where the flesh is softer. 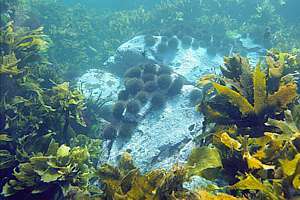 f007212t: By co-operating, sea urchins are able to make clearings in the kelp forest, particularly on top of boulders where the shearing force of storm waves assists them. By staying closely together, they resist attacks from predating starfish, whelks and fish. f012120t: A recent storm has shorn the canopies of all young plants in a zone of no more than 2m wide, showing how precisely the storm barrens are formed. See storm barrens of NZ. f041125: kelp plants extending out from a vertical rock face become a refuge for young blue maomao against raids of cormorants (pied shag) f006625: Underneath the kelp canopy it is dark enough to prevent algal growth, excepting the calcareous encrusting pink paint, such that sponges can compete for space. f017509: murky water causes untimely kelp death, the ones lower down being starved of light first. 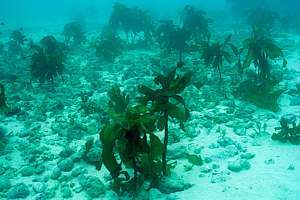 This kelp forest along Great Barrier Island, is symptomatic of habitat degradation occurring there. 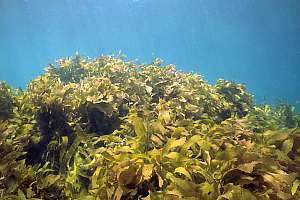 f016803: In January 1993, the whole kelp forest from Leigh to Great Barrier, Mokohinau and Hen and Chickens, died from 10 metres down. It was caused by dense plankton blooms, lasting for over six weeks, with visibility less than 4m. 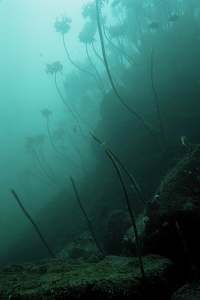 The murky waters starved the kelp of light. 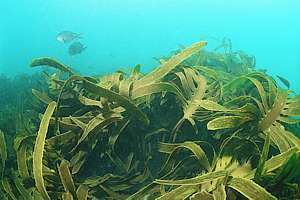 The next year, a similar disaster happened, and it took six years before the kelp forest had a closed canopy again. 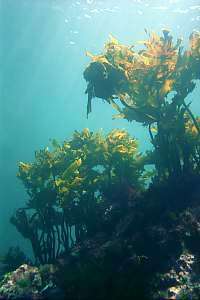 f033820: This kelp forest almost died from lack of light, showing how each plant grew in different directions long ago.